A dear friend, Pastor Marsha, wrote the following article..I received it on my facebook page and decided it was the right time to share these thoughts. We celebrate Christmas with family and friends..receiving and giving gifts, as it has been our tradition. How did the idea of giving gifts really start? Perhaps this article explains it best ! 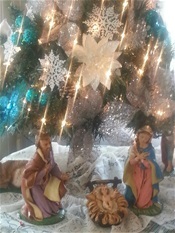 Isaiah the prophet wrote: “For unto us a child is born. Unto us a Son is given. ...and His name shall be called Wonderful, Counselor, the Mighty God, the everlasting Father, the Prince of Peace. The angel that appeared on the hillside that Bethlehem night, told the shepherds, “For Unto you is born this day in the city of David, a Savior, which is Christ the Lord.” These are ...very important words that we often take for granted. Take particular note of the pronouns in these passages. Isaiah could take ownership of the gift of the child for himself and for mankind; “Unto us,” he said. The angels could not take possession of the gift of the Savior and the salvation that He was bringing. They said, “Unto you”. The Bible shows that one third of the angels of Heaven fell with Lucifer. Yet God sent no form of redemption to them. How is it that God had such love and mercy toward such an insignificant, frail creature that He called man? It is past our understanding that God so generously gave the gift of His only Son for you and for me! 1 Peter 1:10‐12 in speaking of salvation and the grace of God that is extended toward man, the Apostle Peter concludes by stating, “which things the angels desire to look into”. Think about it from the angels’ perspective for a moment, will you? Can you imagine the angels’ wonderment of the Heavenly message that they were sharing with those scraggly, smelly shepherds? Can you imagine their horror, thirty‐three years later, as the Son of God was stripped, beaten, and crucified? Today, their disillusionment must continue, as people refuse to worship and pay homage to the “darling of Heaven”, but instead celebrate empty material icons. You see, the angels know who Jesus really is: the King of King and the Lord of Lords. Heaven continually worships and adores Him while so many on Earth try to prevent even a remembrance of his nativity or a salutation commemorating His birth. What a privilege you and I have been given! We have an opportunity to receive this amazing gift of salvation, which includes eternal life. We not only have the joy of believing upon our Savior, but have the honor to have him come and live in our hearts and lives. (John 14:23; Rev. 3:20) One day in Heaven, the angels will have to fold their wings as you and I sing the song of the Redeemed! In this season of gift giving, let us not forget that we have been given the greatest, most spectacular gift of the ages! It came addressed to you. The gift, Himself, is called, “Wonderful”. He is simply waiting for you to open your heart and receive Him.